We are surrounded by a world that’s filled with complexity, and it will continue to become more complex. This is especially true with technology. The smartphone in your pocket is wildly more powerful than the computers that helped put humans into space nearly five decades ago… and they take selfies (Puiu 2017). There were a lot fewer people who knew how to use NASA’s computers back in the late 60s than who know how to use a smartphone today. Part of what makes these technologies more accessible is a design trend where the ends and the means of a technology are separated, or masked, from the person who makes use of it. Meaning that the person who makes use of a technology typically only has insight into the content that the technology offers (the ends) while how it works or what it does (the means) is not very relatable or accessible. And this makes sense — as technologies become more complex, the means are less and less intelligible to the layperson. But, we’re now comfortably in a new technological era where the current nature of these technology’s complexities involves active communication and exchange with other parties. This is the era of the IoT. Having this complexity masked from the layperson is fraught with ethical and political concerns that we need to develop ways to navigate. The problem isn’t with the technology itself. Instead, it’s how the technology shares what it does with us. In this chapter, we turn to history to understand how this masking of complexity has become a hallmark of technological development. We examine this history through other lenses of philosophy and psychology to understand the consequences of this trend, as well as identify potential design alternatives to it. This provides us with some insights and directions to how this complexity can be revealed and managed with IoT products. We close offering one speculative design to illustrate this point. To give some context to this trend of technology’s advancing complexity and corresponding trend of masking that complexity, let’s take the example of water collection. We would first bring water into our homes by collecting water from its source. We would walk to the river or lake to fill a vessel to bring back to our home. Later we developed technologies like aqueducts, wells, and pumps to limit the inconvenience of collecting the water by delivering it to a collection point. Later this infrastructure was advanced even further so that the water would be delivered directly to our homes. We then developed the means to heat or cool the water directly in the home, and pump it to the various rooms and appliances that they would be ready, and on hand, when desired. With faucets with proximity sensors, this is taken even further, you don’t even need to directly engage with the technology, it is automated and acts just on the basis of your presence. In each of these cases, we see that the technologies are becoming more complex, and in parallel, that complexity is being masked from the people it involves. We don’t see the systems of pipes and tunnels that deliver the water to a pump or a house. We keep the water heater and pump in the dark and rarely visited corners of homes. Eventually, our engagement with the technology is reduced to merely the content that the technology produces: the water. We give little attention to the complexity of what lies behind this water itself. And why should we? It’s here, it’s at our service, and it’s making our life easier. This is true with so many different contemporary technologies. We no longer crank cars to start them. The presence of a key in our pocket alone can make it start. We don’t cut wood and lie fires. There is now a thermostat that knows your comings and going and can senses your presence and sets itself on to your specific preference. Technologies are becoming more complex, but all are also hiding their complexity, making it a little less visible and relatable. This trend has not gone unnoticed by philosophers of technology, who also have some thoughts on the implications of this pattern. The philosopher Albert Borgmann picked up on this shift in the early 1980’s and termed it as the “device paradigm” (Borgmann 1984). In this paradigm Borgmann observes that as technologies become more complex, that complexity is masked. This masking is essentially a function of separating the ends of the technology from its means. We don’t see, nor are we a part of, how the technology works. Instead, all we see and can engage with is the output of the technology. In his analysis, he identified this trend as having problematic social consequences leading people to over-consume the technology and to render it as an object that can easily be replaced. Perhaps it seems counter-intuitive, that when things such as these are so invisible, so much at our service, or don’t engage our attention, it can lead us to over-consume the content of the technology. But there is a lot of evidence to this point. For example, dishwashers are a tremendous technology that is more efficient in terms of both labor and energy resources. It takes less water and energy to run a dishwasher than to wash dishes by hand. However, what ends up happening is that we run the dishwasher more often, and often when it isn’t even full. As a result, more energy and water go into running it, as well as human labor to load and unload the dishwasher itself. This is a general principle behind our household appliances. It is not a question of how efficient we engineer them to be, we end up using them more than their less efficient predecessors, ultimately thus using more energy (Kuijer 2014; Verbeek and Slob 2006; Herring and Roy 2007). It’s not just philosophers who take note of how critical it is to have the ends and the means of the technology joined together. Psychologists found that when people assembled IKEA furniture themselves, they tended to value it more — regardless if it was assembled properly or even with all the pieces. This is not a question of personalization, this is still a mass-produced product. Apparently “labors of love” are a real thing. The pattern was so profound it has been named the IKEA effect1 (Norton, Mochon, and Ariely 2012). Being involved in the assembly of the furniture is a means of unmasking its complexity, where the ends and the means of the object are literally being joined together by the person assembling it. Further, as an item that was valued greater, the idea of parting from that particular furniture item was less desirable. A similar example of the profound impact that connecting the ends and the means can be found in the struggle for instant cake mixes to be adopted in the US in the 1950s. Simply adding water to the mix seemed too easy and housewives were not keen to accept the product. The manufactures then changed the formula of the mix to require that an egg be cracked and added. This, most likely along with some other variables, lead to the eventual adoption of the product (Shapiro 2004). Here people needed to play a larger role in unveiling some of the complexity behind the technology of engineered food. Again, we see there being a strong motivation for people playing a more critical role in bridging the ends and the means together in the task at hand. We also can find this sentiment in literature. Robert Pirsig even elevates this dynamic of participation to the level of spirituality in his novel “Zen and the Art of Motorcycle Maintenance” (Pirsig 1974). But how does this apply to the IoT, where connectivity and automation are the standard? So we have a demonstrated design trend, as well as a compelling argument from philosophy and psychology about why we should care about putting the ends and means together to unmask the complexities behind technologies. But the realm of IoT technologies offers us another layer of complexity and ethical complications. For the record, when referring to the IoT we are discussing technologies that are data-intensive, make use of machine learning, and/or are connected and networked. We now turn to ask, what are the ethical and social implications specific to masking the complexity of the IoT? We can characterize this in two ways. On the one hand, it can be somewhere between creepy and a nuisance; on the other it can have the influence to shape our world, an inherently political act. We’ll deconstruct this with two examples. First with the archetypal IoT product: the Nest Thermostat. Second with a Google search. The Nest is the sturdy champion of IoT products. It’s connected, it can sync with your phone, and also with other service providers, as well as the company that produces it. It is an object that senses its environment, and the people in it. It can compute what it senses to identify patterns in behaviors and demands, learn, and act upon them. All these features are utilized in such a way where we have minimal engagement with the technology itself and only with the output: a comfortable and temperate home that isn’t just on demand, but anticipates your desires. We don’t have to think to lower or raise the heat; we don’t have to identify bugs in the software. It takes invisibility to an extreme. By sensing its environment in order to perfect its services, it sometimes knows us better than we know ourselves. It can serve as a surveillance system. By checking the status of the thermostat on our phone in your office, you may be able to tell that someone is home when they shouldn’t be. We can become reliant on the technology, and a bit stranded if there’s a bug in the software that doesn’t permit the temperature to dip below 32 Celsius. Here, masking the complexity of the technology can span from being a nuisance to being creepy or invasive. The complexity behind a Google search is similarly masked in such a way that all we can see is the convenience it provides. We think of Google as our personal detective that scours the Internet to find that answer that is best suited to our question at hand. But the Internet is big. To help make the search more pointed, Google correlates different information to make assumptions about what is the most relevant to you. Our detective is first making assumptions of what exactly we are looking for based on our location, our browsing history, perhaps even a demographic that you have been determined to be a part of, and also the ad ranking of these pages. All of this is gathered and evaluated with IoT technologies. This approach offers a degree of convenience to them, yet this search is still separating the means being from one another on a few different levels. Firstly the collection of many of these data points is veiled, it’s not just of the things that you actively do as a person who uses their services, but also ambient information of your location is being harvested from your devices. Additionally, Google’s self-interests are also influencing your search, their capital interests are a factor that informs what answer is presented to you as the most suited to your question. These various data points being collected in a concealed manner, and also how they are being correlated with one another. What is especially disturbing about this is how this service, of providing you with answers, can shape your reality, and awareness, and perception of the world. This can create a bias, or a filter bubble (Pariser 2011), which many were uncomfortably confronted by in the 2016 US presidential election. Not having transparency into how the technology is working, making decisions, literally molding our perception of the world, is inherently political and potentially problematic. And herein lies the conundrum. The way that we’re designing technologies makes them accessible to everyone, but the invisibility that is required to do this is inherently problematic, and also political. But, the opportunity also lies within our understanding of the problem. It’s the way that these technologies are designed that creates the problem. Therefore, there can be ways that design can resolve this problem as well. We shouldn’t be taking away functionality of these technologies, we shouldn’t be making the technology less complex or sophisticated. We don’t want technologies to be a pain, inconvenient, or unusable. Nor should we have the expectation that everyone needs to be some kind of expert in technology. Indeed, these technologies should continue to be accessible to broader populations. However, we need to have some sense of what these things are doing and how. What we need to do is design a language that helps the layperson decipher this complexity. We have seen such a language been developed before…for clothing maintenance. Our role in relation to clothing maintenance has changed dramatically over the past few centuries. There was once a time when households typically made their own clothing. Intimately knowing the materials and how garments were made afforded a high level of transparency, which coupled naturally with maintaining the clothes themselves. However, as the responsibilities for clothing were delegated to other parties, things became more complex. Someone else was making the clothing, and new materials were rapidly being engineered, and more textiles were being made accessible to a wider market. Cleaning those garments had been done by hand, providing the washer with thorough and constant feedback. In this example we see how the person washing is able to link the task of the washing technology (means) with how clean the clothes were becoming (ends). Thankfully, machines that come equipped to wash all sorts of different clothing have replaced hand washing. These machines can control the water temperature, how many cycles it goes through, also how to dry it. Over time, the barriers to access of that technology have been reduced, to the point that it is available in most households. But there is less feedback as to how this technology does its job and how that will impact different materials. Here again the design of the technology separates the ends and the means. There are more materials that have unique care requirements (cold water only, line dry, no ironing, etc. ), and with more advanced washing technologies being accessible to a households there is a lot of complexity surrounding clothing maintenance that is masked. This arrangement leads to a very specific dynamic: a massive gap develops between the complexity of the technology and the extent to which a layperson can relate to its complexity. However, in response, a system of pictorial labels was developed to instruct how certain items of clothing had to be cared for. 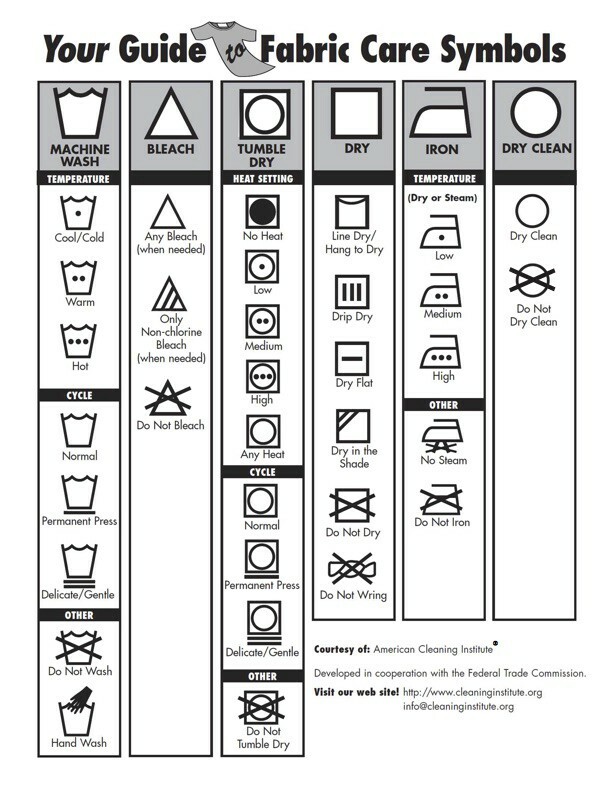 These symbols, known as laundry, care, or wash symbols, have practically become an international convention (see figure 3). The first laundry symbols were emerging in Europe in the late 1950s, around the time when washing machines were becoming commonplace in homes (GINETEX 2011; Cave 2016). These instruction labels are stitched into every item of clothing we buy instructing us on things such as: recommended washing temperatures or how to best dry the item. According to one study, 4 out of 5 consumers refer to these labels before making purchasing clothing (American Cleaning Institute 2017). From these recommendations, we develop a sensibility about how certain materials need to be cared for and treated. We can choose what instructions are overzealous, and which ones are necessary. We know that one red sock in a white load can have an undesired impact. Here washing technology has become more complex and accessible; and that harmony is being supported by a symbolic language system. American care label convention. Provided by the American Cleaning Institution for distribution. We need to develop such a language and sensibility for contemporary IoT technologies that are complex, but currently have limited means of transparency. A speculative design by Belgian design agency Beyond / IO developed one such means to do so. Commissioned by the Just Things Foundation, Beyond / IO created a speculative design to illustrate how to “make the parties associated with an IoT product explicit” (2015).2 This principle mirrors the conflict this chapter has been addressing, pursuing the unveiling of the complexity behind technologies. Beyond / IO created a language to reveal this complexity in a care label for IoT products: Thingformation (figure 4). Similar to a wash label, their pictorial system provides a means to reveal and communicate some of the intricacies of IoT products. Similar to the care label, Thingformation uses simple symbols to convey qualities of a specific IoT product that may not initially be apparent. The intention behind these symbols is to try to tell the story of the product before it’s used. The label classifies a product on five distinct, although interrelated, qualities: type of encryption used with the product, the number of companies affiliated with the product, what body of laws regarding data protection is the product being held accountable to, the expiration date of the product, and lastly a graded evaluation of the trustworthiness of how reliable the company is with how they use their customer’s data. The designers of Thingformation envisioned that such a labeling system would be supported by regulatory bodies, to whom the companies that make these products would report to. 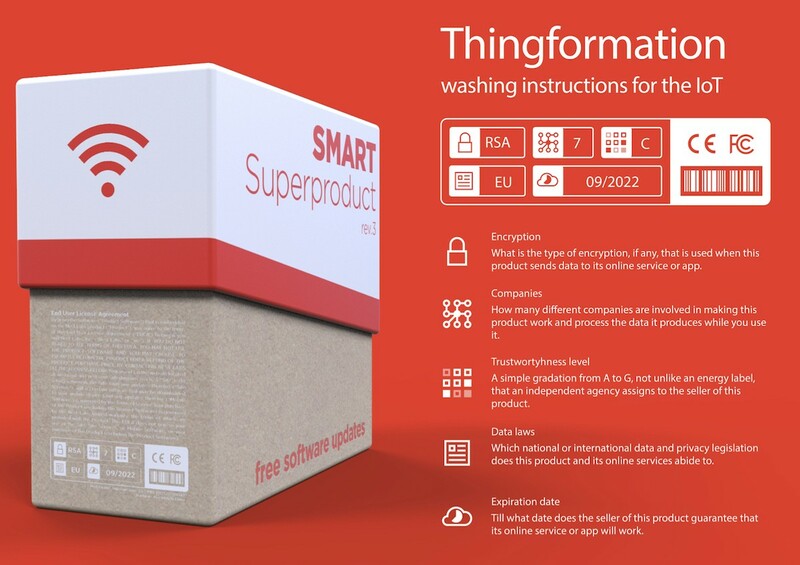 Like the wash label, the Thingformation labeling system limits the qualities that have to be interpreted or evaluated, favoring qualities that are objective or purely factual (such as what type of encryption is used, the number of companies attached, what laws are followed, and the stated expiration date). The only quality that requires subjective evaluation is on the measure of “trustworthiness,” which would be calculated by the regulatory body. The designers of Thingformation recognize that IoT products are a part of a complex system, and this labeling system is a modest first step at making it more accessible to people. But, we see similar rating systems regarding environmental and energy usage having an impact on both product regulations and consumer behavior. Thingformation is offered as a means to not only help inform purchasing decisions, but will also hopefully motivate industry standards and support the development of our sensibilities in navigating and understanding these complex technologies. It would be an attempt to help close the knowledge gap between these intricate technologies and the layperson. Thingformation. Speculative design by Beyond / IO for Just Things Foundation. IoT care labeling system. Drawing on these different themes and disciplines from history of technology, philosophy, and even psychology help us situate the role that design plays in shaping our relationship with technology. These perspectives help us identify, understand, and contextualize technology’s role in our society, and also gives us some insight into where the solutions for some of these problematic aspects may lie. It may seem undesirable, or futile to challenge the predominant assumptions for, and trends in, how technology should be designed. We argue that there are small course adjustments necessary, but that they are feasible and not even radical — we can find existing models in the design of other products already. The impact that IoT technologies have on us personally and as a society is important. We should regard the necessity to shape a culture of responsible IoT as equally important. American Cleaning Institute. 2017. “Clothing Care Labels May Now Use Symbols Instead of Words.” American Cleaning Institute. Accessed May 30. Borgmann, Albert. 1984. Technology and the Character of Contemporary Life. Chicago: University of Chicago Press. Cave, James. 2016. “A Genius Guide to Understanding the Laundry Symbols on Your Clothes.” Huffington Post. Accessed August 23, 2017. Herring, Horace, and Robin Roy. 2007. “Technological Innovation, Energy Efficient Design and the Rebound Effect.” Technovation 27 (4): 194–203. doi:10.1016/j.technovation.2006.11.004. Norton, Michael I, Daniel Mochon, and Dan Ariely. 2012. “The IKEA Effect: When Labor Leads to Love.” Journal of Consumer Psychology, no. 22: 453–60. Pariser, Eli. 2011. The Filter Bubble. Penguin. Pirsig, Robert M. 1974. Zen and the Art of Motorcycle Maintenance. Harper Collins. Puiu, Tibi. 2017. “Your Smartphone Is Millions of Times More Powerful Than All of NASA’s Combined Computing in 1969.” Accessed May 17, 2017. Shapiro, Laura. 2004. Something From the Oven. Viking Press. Verbeek, Peter-Paul, and Adriaan Slob, eds. 2006. User Behavior and Technology Development. Springer. 2015, “The IoT Manifesto.” IoT Manifesto. May. http://iotmanifesto.org. Holly Robbins is a PhD candidate at Delft University of Technology at the Connected Everyday Lab (The Netherlands) where she works at the intersection of social sciences, humanities, and design. Her work focuses on shaping relationships with data-intensive objects (those connected to the Internet and that collect data) that are based on reciprocity. Holly’s work explores how design approaches can express the im/materiality of these objects — where the materials of these technologies can be just outside our grasp such as code and algorithms. Specifically, she explores how traces can serve to support the relationship between people and the im/material qualities of these objects.